Last week, I wrote how Microsoft is making inroads in the enterprise with their Office Communications Server 2007 R2 platform and how they are looking to achieve five 9s of reliability. Well, one other critical feature needed for an enterprise phone system is decent call recording. 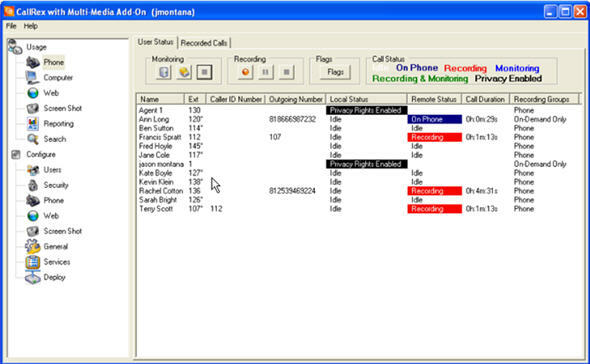 Unfortunately, there does not seem to be a lot of options for call recording on OCS 2007. One of the problems is that not all calls go through a PBX. 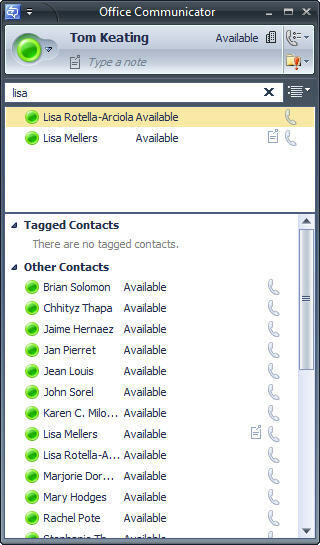 For instance, you can use the Microsoft Communicator client to call a co-worker who is also using Communicator. The call is a peer-to-peer SIP session that doesn't go through a PBX, so the PBX can't leverage it's call recording capabilities to record the call. 1) You can go the "cheap" route and download the FREE open-source Wireshark packet sniffer program. Wireshark can decode VoIP packets, including the RTP audio stream and save it as an .au file (you can convert to .WAV if you need to). All you need to do next is "mirror" a port on your switch that sees all the VoIP traffic and then hookup a PC to monitor and record the traffic. 2) Another similar option is Cain and Abel. Cain & Abel was designed as a "network administrator security tool" to pinpoint security holes. I put that it quotes, since it can also be used as a hacker's tool. Essentially, this "security" software product can record your SIP-based VoIP applications. Cain's sniffer can now extract audio conversations based on SIP/RTP protocols and save them into WAV files. The following codecs are supported: G711 uLaw, G711 aLaw, GSM, MS-GSM, ADPMC, DVI, LPC, L16, G729, Speex, iLBC. 3) You can go the "professional" route and install a 3rd party SIP-recording platform that monitors ALL SIP VoIP traffic. One good one I recommend is SIP Print. It's a 1U appliance that captures SIP VoIP traffic and has a web interface to access recordings. In theory, it should work with OCS but I haven't tried it. I like the SIP Print appliance and am finishing up a full-fledged review which I hope to publish this week. 4) You can try http://live-pa.com/ which is launching this summer and is specifically design for OCS. To record, all you have to do is "invite" the Live-PA contact. It starts recording immediately when invited into a conversation on any Office Communicator (OC) enabled computer or communications device. It's a hosted offering, without the need for on-site software and hardware recording equipment. According to Live-PA, "Just think of Live-PA as another OC contact, but, in this case, one that you hire and use whenever the need arises. To hire the services of Live-PA, sign up, and simply add the Live-PA.com Manager to your list of OC contacts. That's it - no software or hardware to install and maintain!" The Live-PA software resides on its own secure servers, and is accessed via the internet whenever you use Live-PA.com Manager. They give you unlimited storage capacity. Nice! 5) Telrex has a call recording offering for OCS available today. According to their website, CallRex™ software enables businesses to implement Microsoft Unified Communications while maintaining and extending their call recording and monitoring business processes. CallRex further extends the value of Office Communicator 2007 by making recorded calls accessible at the desktop. For example, Microsoft Unified Communications users can link recorded calls from the CallRex solution to customer records in Microsoft Dynamics CRM. In addition, call recording and monitoring features can be integrated with business applications via the CallRex API™. Update: I should mention that although many of the above solutions can capture the SIP traffic - including the RTP stream - you might have problems playing the audio back since Microsoft uses their packet loss concealment RTAudio adaptive codec within Communicator. Not sure if Microsoft Media Player can play this codec or not. Hmmm, might have to do some packet captures and see if this works! It's certainly possible that a future release of OCS could feature a decent call recording feature built-in that is 100% software. It would be nice if you could simply click a record button from within Communicator and it records the call as a .wav file directly to your PC. Microsoft no doubt is working on a future OCS release that is 100% software without the need for a PBX, so they'll need a 100% software-based recording solution as well. Maybe it won't be a fully-featured call recorder that puts recordings on a centralized server for call center managers, admins, etc. with fully reporting capabilities -- but certainly OCS's Communicator client should act at least as a "personal" recorder. I should mention that while Microsoft OCS 2007 R2 did not quite herald the death of the IP-PBX, most experts, myself included, predict a future release of OCS that doesn't require a PBX. Who knows - maybe OCS 2010, OCS 2011, or a later release will be PBX-free? Probably sooners rather that later, that day is coming. A 100% Microsoft UC solution without the need for a PBX/IP-PBX at all could be a game changer. Of course, the current version, Microsoft OCS 2007 R2, does have some limited support for SIP IP phones, so you could throw out your existing PBX today if you wanted to. Any future release of OCS will have to support SIP phones from popular SIP phone players such as Aastra, Polycom, and snom. Also, most businesses aren't ready to toss desktop hard phones for a 100% software-based softphone solution, i.e. Microsoft Communicator. Additionally, any future OCS release will have to include all the advanced call center functionality you get from Nortel, Avaya, Mitel, or even some low-cost Asterisk-based PBXs, if they plan on completely eliminating the need for a PBX. A 100% software-based IP-PBX with unified communications capabilities, advanced call center functionality, and call recording would certainly be a compelling choice for many businesses. 1) You can go the \"cheap\" route and download the FREE open-source Wireshark packet sniffer program. Wireshark can decode VoIP packets, including the RTP audio stream and save it as an .au file (you can convert to .WAV if you need to). All you need to do next is \"mirror\" a port on your switch that sees all the VoIP traffic and then hookup a PC to monitor and record the traffic. 2) Another similar option is Cain and Abel. Cain & Abel was designed as a \"network administrator security tool\" to pinpoint security holes. I put that it quotes, since it can also be used as a hacker's tool. Essentially, this \"security\" software product can record your SIP-based VoIP applications. Cain's sniffer can now extract audio conversations based on SIP/RTP protocols and save them into WAV files. The following codecs are supported: G711 uLaw, G711 aLaw, GSM, MS-GSM, ADPMC, DVI, LPC, L16, G729, Speex, iLBC. 3) You can go the \"professional\" route and install a 3rd party SIP-recording platform that monitors ALL SIP VoIP traffic. 4) You can try http://live-pa.com/ which is launching this summer and is specifically design for OCS. To record, all you have to do is \"invite\" the Live-PA contact. It starts recording immediately when invited into a conversation on any Office Communicator (OC) enabled computer or communications device. It's a hosted offering, without the need for on-site software and hardware recording equipment. According to Live-PA, \"Just think of Live-PA as another OC contact, but, in this case, one that you hire and use whenever the need arises. To hire the services of Live-PA, sign up, and simply add the Live-PA.com Manager to your list of OC contacts. That's it - no software or hardware to install and maintain!\" The Live-PA software resides on its own secure servers, and is accessed via the internet whenever you use Live-PA.com Manager. They give you unlimited storage capacity. Nice! It's certainly possible that a future release of OCS could feature a decent call recording feature built-in that is 100% software. It would be nice if you could simply click a record button from within Communicator and it records the call as a .wav file directly to your PC. Microsoft no doubt is working on a future OCS release that is 100% software without the need for a PBX, so they'll need a 100% software-based recording solution as well. Maybe it won't be a fully-featured call recorder that puts recordings on a centralized server for call center managers, admins, etc. with fully reporting capabilities -- but certainly OCS's Communicator client should act at least as a \"personal\" recorder.